10AM in Morehead City and Snow! It's of the non-stickable kind at the moment with temps. hovering around 34 degrees. It was 46 degrees when I headed out for my morning run at 5:15AM. It dropped 4 -5 degrees by the time I got back home an hour later. I love the weather along the coast!! Never boring,Always changing, Usually dramatically and drastically. Yup! 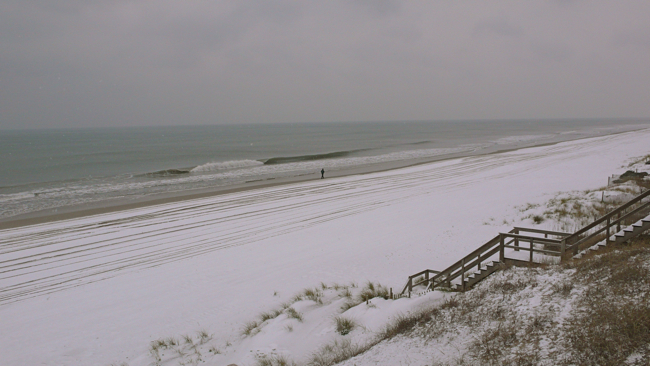 Its snowing here in Wilmington, too.. very lightly right now. We had a couple of inches in Hampstead - looks like a winter wonderland outside! I love this! Hope we'll get a little bit more before the day ends! Not only is the threat of snow a legit reason to cancel school along coastal NC but the mere mention of snow is too! I remember a few decades ago when the Crystal Coast ran out of sand. Yep-We didn't have enough sand to spread out on our bridges. Think on that one a little bit!! Remember michiganmom, there are few if any snow plows here and most bus drivers, not to mention regular drivers, have absolutely no experience driving in snow. Would you trust you children to that? That said we now have about 1 inch of snow here in New Bern with a temp of 28F. Well I didn't mean to upset anyone but being from Michigan this snow is a dusting. I'm just saying we have none so the forcast wasn't quite right. I just find ot funny that a little snow gets everyone silly and yet when there is a hurricane warning people act like it will be a little wind storm. I guess it is just what we are used to and have grown up with. All I can say being from a place all my life that got snow that in MIchigan the first snowfall each year people drive like fools and forget how to drive in the snow. It isn't that hard if you follow one word..slow. If you think you can drive the speed limit on snow you will be sorry. About 4:30 this afternoon we drove over the beach at Emerald Isle. The roads are wet with a little ice where there is a bridge or a culvert. The Emerald Isle Bridge was a little icy but they were sanding it as we went over. A number of the back streets on Emerald Isle where there is little traffic were snow covered, but it is certainly less than an inch. I snapped this picture of the beach before we left. For the northern people that are saying everyone is freaking over such a small amount - you must remember that we don't have the equipment to deal with it. Not only that, but we only see snow occasionally so we tend to get excited and giddy when we do see it, just b/c it's so rare. The schools start closing b/c they don't want the kids to be unsafe while transporting them via buses (i.e. slippery roads). I was in Michigan for Christmas and they had several inches. I drove on it just fine even though I have minimal experience driving in snow. It was slippery and slushy, but the main roads were plowed and everyone slowed down so it wasn't too bad. There is a huge difference in the road conditions in that area b/c they had the equipment to handle it.